Yesterday I just experimented on my favorite food paneer – Green Paneer Tikka. If you read my last article on unknown facts of super seeds, you must be aware of the immense nutrients and benefits it has. So wanted to check if I can add those super seeds to my super favorite food and make it immensely nutritious and tasty. 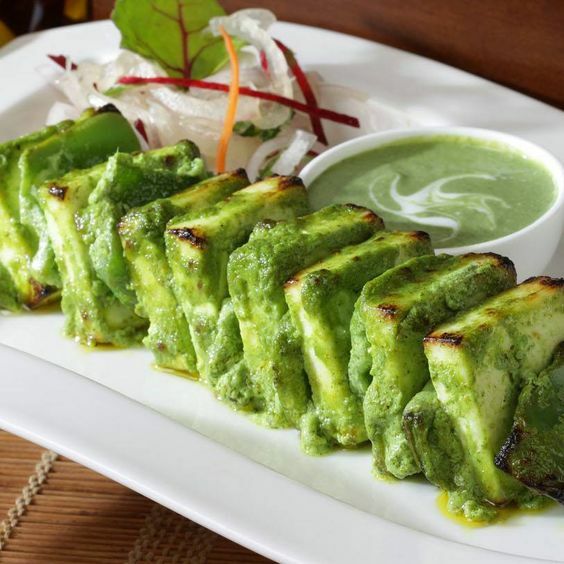 So would like to share the recipe of Green Paneer Tikka also known as hariyali paneer tikka in Hindi. Churn Palak, coriander, garlic, ginger, green chilly, black pepper, sunflower seeds, pumpkin seeds in grinder. Make it a very smooth paste. Once this gravy is ready, take a spoon of ghee/ butter in pan. Put this gravy and let it simmer for 10 mins. Once the gravy is almost ready, add fresh cream and cheese and put the gas off. Now take the paneer pieces and brush them with little butter. Do similar grilling for vegetable also. Once the paneer is grilled, add it to the ready gravy. And this makes your Garden Paneer Tikka Ready. It was so yummy that I could not resist it and forgot to click the original picture of the recipe. But attached pic to this recipe is very close to the actual appearance it will give you. So similarly you can add pumpkin seeds and sunflower seeds to many such recipes and enjoy the taste and get all benefits out of it. Do try it and post the picture. I will be happy to post your picture of recipe in this post. Keep commenting and also visit our Facebook page.